The anti-lock brake system is a complex configuration of computers and sensors. When all of the components are working in perfect harmony, it ensures a quick, reactive system that can improve braking control under all surface conditions. Faults in this system are often first indicated by illuminated lights in the gauge cluster. 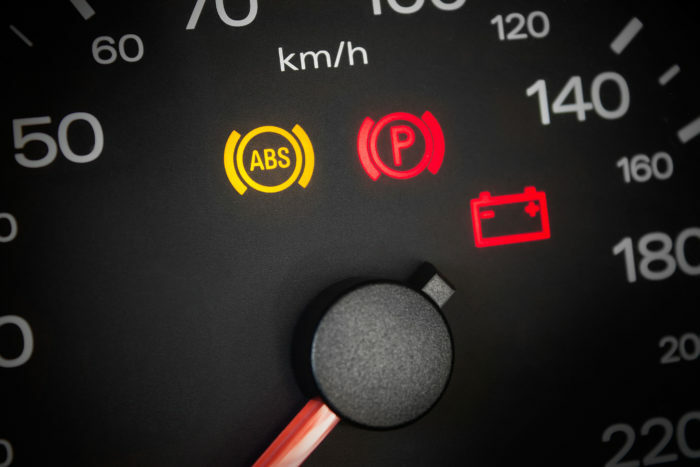 On most vehicles, only the ABS light will illuminate when a fault is detected. What if your car or truck has both the ABS & BRAKE lights illuminated? The “BRAKE” light has always meant one simple thing: There is a fault with the braking system. Most commonly, this light is triggered by low brake fluid or an engaged parking brake. However on some vehicles, it can simply indicate a problem elsewhere in the system and can be illuminated immediately if there is an ABS fault. The ABS light differs from the BRAKE light as it is usually controlled by a computer module. When this light is on, there are often trouble codes stored to help the owner or a technician diagnose the source of the fault in the anti-lock braking system. The BRAKE light on most vehicles is activated by a simple circuit involving only one or two components. Usually, the brake fluid level sensor and the parking brake are the only two items that can activate the BRAKE light. But, not all vehicles are the same, and some of the earliest ABS systems would trigger both lights simultaneously for any ABS fault. It is important to know what to look for when diagnosing the cause of one or both of these lights illuminating on your vehicle. Each light has their own set of triggers; and some shared between the two, and some not. Depending on the year of the vehicle, most ABS codes can be read by OBDII-based diagnostic tools on ‘96+ vehicles. On older vehicles or in special cases, a make-specific tool must be used, often owned by dealerships or independent shops. No matter which light is on, don’t ignore it for too long. An illuminated ABS or BRAKE light is not only a minor annoyance but can affect resale and trade-in value, as well as raise a few eyebrows when it comes time to get the vehicle inspected. (State laws may vary) With a keen eye and a DIY approach, most ABS and brake system repairs can be done at home.